But sometimes the stars and planets are in perfect alignment, and the event not only lives up to its hype but reaches far beyond expectations. There was a nearly sold-out club and dining room, pretty rare for the first of a four-set, two-night booking. And this audience included Karrin’s husband Bill McLaughlin, frequent touring partner/pianist Laura Caviani, and Karrin’s mom (who lives in Minneapolis) and other assorted friends and relatives. But a lot of credit goes to this band, surely the most elegantly supportive ensemble she has brought to the Dakota yet: Long-term collaborator/guitarist/arranger Ron Fleemans; Chicago-based bassist Larry Kohut; acclaimed vibes magician and Dave Holland partner, Steve Nelson; and our own master of percussive eloquence, Phil Hey. Each contributed mightily to the whole and as a soloist, and the vibes provide unique colors and textures seldom heard with a vocalist. This time Karrin is not touring with a keyboardist, handling piano duties on a number of the songs herself. And that’s not dumbing down the accompaniment. Not at all. As Gary Giddens once wrote, “she plays a mean piano.” Actually Karrin plays a lyrical and songful piano. It wasn’t just me. I heard many others comment that this was the best Karrin Allyson set they’d heard. And I’ve heard her each time she has visited the Dakota since at least 2003. This tour is truly a Bilingual Songfest, with many songs from her new bilingual recording, Imagina: Songs of Brasil. 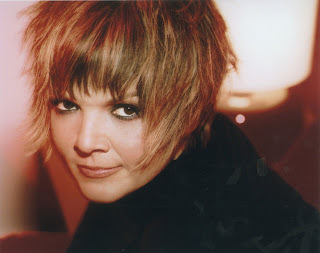 Karrin has been performing Brazilian tunes, often in Portuguese, since her first recording, but most of the tunes on Imagina have not been in her recorded or touring repertoire for long, and she sings all fourteen in Portuguese, as well as many in English as well. Chris Caswell, her lyricist on her last CD, Footprints, returns with some new English lyrics for several songs, while she also makes good use of the words of such notables as Jon Hendricks, Susannah McCorkle and Gene Lees. The opening set was outstanding for many reasons, not the least of which was the selection of tunes. About half of the new recording was presented, including the pensive Vinicius de Moraes tune “Medo De Mara (Surrender the Soul”); a bright English setting of “Desafinado” as well as other gems from Jobim—his first tune and her title track, “Imagina,” “A Felicidade” from Black Orpheus; the delightful “Correnteza” (with Nelson here on vibes rather than marimba, but effective nevertheless); “So Tinha De Ser Com Voce”; and the sweet “Estrada Branca (This Happy Madness).” But Brazil was interlaced with ballads, blues and even a little French (the silly “Patout”): Johnny Burke's “What’s New?” (a Coltrane favorite), Blossom Dearie’s “Bye Bye Country Boy,” Hank Mobley’s “The Turnaround,” and Nat Adderley’s “Never Say Yes”—the latter pair from her marvelous 2007 release, Footprints, with new lyrics from current collaborator Chris Caswell. I never tire of her sparkling, deep-inside-the-lyric presentations. Maybe she saved the best for last. Cajoled by applause to return for an encore, Karrin chose to go it alone at the piano, delivering a sensitive, sensual take on Billy Joel’s “And So It Goes.” And so it went, elegantly. Usually artists warm up over the course of their multi-night engagement. If so, the final set tonight will be a nuclear meltdown. I’d return for a mere repeat. Photo courtesy of Concord Records. Once upon a time, Karrin had an apparent aversion to photographers at her live gigs. She seems to have relaxed about that (as long as there's no intrusion of flash) and maybe next time I'll have a seat in a more photo-friendly location. Art Tatum Live? Send in the Clones!